Four Points Re SPC, Ltd. is an off-shore insurance company whose primary line of business is reinsuring risks undertaken by its affiliates StrucSure Home Warranty and Golden Insurance Company. Catastrophic risks are also underwritten and reinsured by Four Points Re SPC, Ltd. Strategic Risk Solutions provides captive management services for Four Points Re, SPC, Ltd. 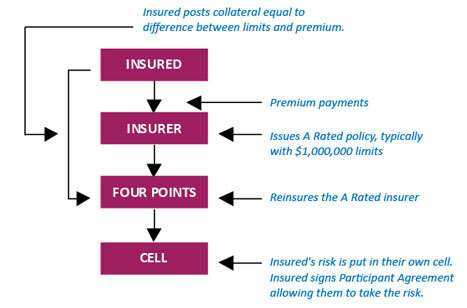 The Four Points Re SPC, Ltd. segregated portfolio company is also an alternative risk financing vehicle for insureds looking for the advantages of a captive insurance company without the time and financial commitment involved in establishing a wholly-owned insurance company of their own. Segregated portfolio company (SPC) rent-a-captive programs are customized to reduce your cost of insurance. Four Points Re, SPC Ltd. is a Cayman-based segregated portfolio rent-a-captive facility that is regulated by the Cayman Island Monetary Authority (CIMA). In a segregated portfolio setup, a modest premium is paid to cover expenses and expected losses. Then the participant posts collateral, often in the form of a Letter of Credit (LOC) to secure the difference between the premium and the program’s aggregate limits, thus creating a situation where the policy is fully funded. Once the policy expires, after all claims obligations are identified or eliminated, any collateral and premiums not used to pay losses are returned to the participant. Four Points has made a Section 953 (d) “domestic election” under the Internal Revenue Code to pay taxes as if it were a U.S. entity. Four Points is formed under specific Cayman law which allows us to segregate the assets of each program. This effectively provides a firewall against potentially adverse results from other participants using the same rent-a-captive. Interested in learning more? Click here to fill out our short online interest form and a member of our staff will contact you. Copyright 2013 Four Points Re SPC, Ltd. & StrucSure Risk Management Group. All Rights Reserved.